This weekend, the Kindle version my book Peace on the Journey can be downloaded for free. 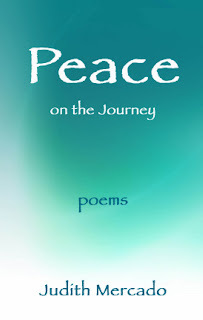 The Peace on the Journey poems explore the theme of renewal in the face of adversity. Influenced by the haiku form, the collection offers a poem a day for a year, though one can easily start on any page and progress in any order. This availability ends after April 27, 2014. While my joy and pride came in part from seeing my name on a published book, they also came from knowing that this book is a fundraiser as well. Ten percent of its net proceeds are designated for the Myelin Repair Foundation, a deserving research organization which might transform the lives of millions suffering from MS. Yet, I have dreaded the promotional stage of this book’s journey. Then I realized, how will anyone know about the book if I don’t tell them about it? How will potential readers benefit if no one feels motivated to purchase the book? I must enjoy promoting this book as much as I did writing it. Still, promoting a book of poetry has felt strange.The thing is, I never expected to produce a book of poetry. I was, I thought, a published short story author seeking to be recognized for her novels some day. Then, in 2009, in addition to this blog focused on literary and cultural themes, I started another one called Peace Be with You. The reason was I wanted to write anonymously about my own journey with MS. Somehow, that MS blog segued from prose into poetry. Don’t ask me why. It just happened, and I went along. Then, people began asking if the poems were available in a book. I kept saying, no, no, no. First, I didn’t know if I was physically up to producing a book. Second, I still resisted identifying myself as a poet. Then, one day, I realized that I might not be a poet with a capital P, but my writing was resonating with readers. Why not provide the book they were asking for? I proceeded to winnow my blog’s roughly 1100 poems into 366. This format would offer a year’s worth of poems for anyone dealing with loss of any kind. Over the next two years, during which there was some teeth gnashing and, yes, a few choice curse words, I finalized the manuscript for publication. Now, the paperback and Kindle editions are available on Amazon. Not infrequently, I gaze at the book with a sense of wonder. Did I really write this? Daily, for my own inspiration, I read the book’s poems on my Kindle. Strangely, the poems read as if someone else has written them. They feel transformative, though I am already deeply familiar with their content. Indeed, Peace on the Journey feels like the universe’s gift to me. Peace on the Journey is Available! The book’s available! Here is the link. They are still working on the Kindle version, but it will be available soon as well. I hope you enjoy the book. Here’s part of the book description appearing on the Amazon page. May my poems illumine your journey.